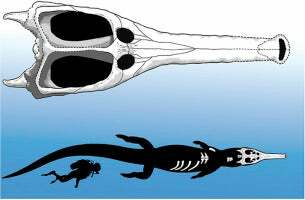 Researchers from Italy and Tunisia recently uncovered an unusual fossil: a bus-sized marine crocodile with teeth meant to crush bones. The fossil’s location suggests that the Jurassic extinction event that occurred over 200 million years ago may have been a long, gradual process, rather than a sudden, global snuffing out. If you were transported 130 million years back in time, and were walking along the edge of the serene, though shrinking, saltwater lagoons covering what is now Tunisia, be careful. Machimosaurus Rex, the animal described in the latest issue of Cretaceous Research, is an ambush predator. If it were to lunge out at you, you wouldn’t have much of a chance to get away. Its head is bigger than that of a T-Rex, and its teeth are made for crushing bones. At 35 feet long, it’s the biggest of the Thalattosuchia—the Jurassic-era marine crocodiles. First discovered in 2014, researchers determined from the dimensions of the skull that the fossil was that of a previously-unknown species. Its relatives had ranged as far as Europe, but by the time of Machimosaurus Rex, the shallow ocean waters over Europe were receding, and Tunisia was the only place the giant marine crocodiles could survive. And survive it did. Found among 130-million-year-old rocks, Machimosaurus Rex was a survivor. The end of the Jurassic Period was marked by huge die-offs, but the end of the Jurassic Period was 145 million years ago. That means the crocodile out-lived the die-off by 15 million years. This fossil indicates that the die-offs may have been local, instead of global, and that the extinction might not have been as quick as we once imagined. We can’t learn much more about Machimosaurus Rex at the present. Although the skull was unearthed, political turmoil around the site of the find keeps researchers from going back and uncovering the body, or any other fossils in the area. We can all hope, for many reasons, that some day researchers will be able to go back and learn more about Machimosaurus and the time period in which it lived.